The loveliest and sexiest Christmas outfit is only really worth wearing when you aren’t one of the twenty other people wearing a largely identical one in the same room. Can we see something more creative than one more variation on the red bikini with white fur, please, or is it too late to make one? MystiTool Dance plugin got updated to version 1.2! Fixed yet another silly bug that would prevent AO control other than MEAO and Franimation from working, and added the ability to control AO gadgets that support the AutoZHAO protocol. Switching to MEAO is still better in the long run, but if you can’t for some reason, AutoZHAO might do. Update process as usual — rez the box you got it in on the ground, get the new version, delete old “Dance controller” script, insert new one, make sure it’s set to “Running”. MystiTool Prim count plugin — a plugin for the full (paid) version of Mystitool which gives it a prim count command, assignable to a configurable button and available in the plugins menu. Since a script cannot give you any information you weren’t able to see in the About Land window, it’s usefullness is rather limited, but well, a configurable button might be handy for someone. I like red. There’s red and then, there’s red, and that latter is the one I like. Warmer, colder, brighter, darker… 0xFF0000 is my red. I didn’t always like red, I must admit. But it’s the color that worked. Few people notice, but whenever I discuss something actually important, I talk in symbols and quotes, using references as words in a vocabulary that doesn’t fit into human language in hopes to convey meanings that it can never truly hold. Maybe it’s a side-effect of how I learned words, and it’s so easy to say, “that’s how it is”, but if it were that simple, if I could squeeze my worldview into a tiny word, it would distort space with it’s mass and fall through the floor. That red is special. It is the color of fire that a fire never has, it is the color of blood, that the blood never is, it is the color of hope, that has no color at all. But when I look at myself on the screen, I remember I still have it, somewhere, somehow, despite everything, that hope that tomorrow will be a new day, and that one day, after one more try, one more push, and one more sharp word, it will all actually work. 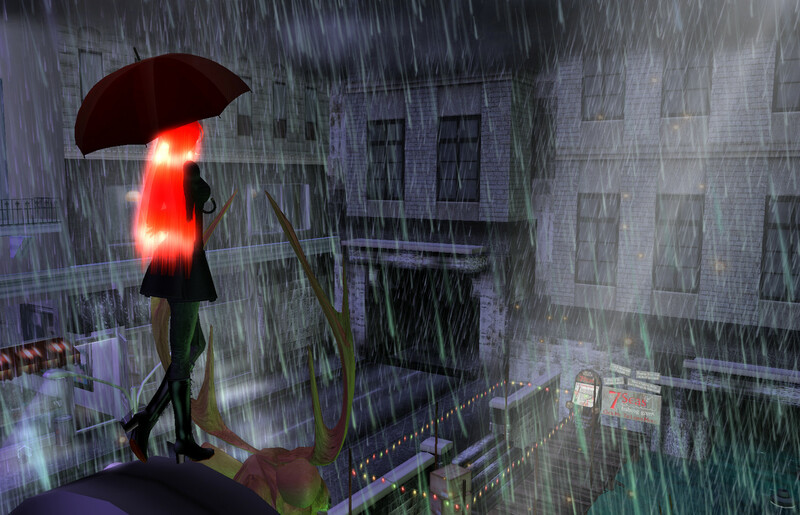 And I have the reddest hair in Second Life. And then I get up and try again in a different way. As the sim slowly rezzed around me, and the textures turned from uniform surfaces of grey to dirty smudges of color, as the first prims appeared floating in the air where people should be, — I’ve turned those ghostly green clouds off months ago — and the sounds finally got cached, I almost fell out of my chair. I reached for the amplifier and pressed the power button with a trembling hand. It was the sound of a million typewriters, clacketing on, flowing into a mighty, deafening roar, resonating all across the grid, a pervasive, inescapable noise, so loud and unnatural, that it does not get perceived as a noise at all, so when you turn it off, for a short while you can’t even tell if you still hear it or not. The monkeys were working on “Hamlet”. The islands must fill the purpose of orientation, that is, teach people the ropes. Whatever place advertising they choose to put there and whatever price they ask for, a non-profit advert of a location of Linden choosing must appear next to it. And that would be it. The islands would be sold for a certain period, like maybe three or six months, at the end of which the auction would happen again, with the current owners having some kind of bonus. I’m willing to bet retention rates would rise from 20% to at least 60%.